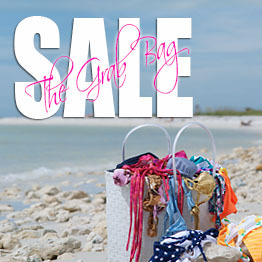 YOU HAVE FOUND THE EXTREMELY POPULAR GRAB-BAG SALE!! Originally created for models & photographers, our Grab-bag sale swimsuits are made up primarily of unique swimwear designs, discount priced and ready to ship worldwide! The more you buy, the less you pay per swimsuit! You will receive an e-mail with our current list of sale suits upon your request. Simply send in your request. *For pictures of many of these sale items, see the "Grab-Bag" Album on our Facebook fan page. We will then send you the complete list of discount swimwear styles up for "grabs" in the bag. After looking through the list in the Grab-Bag Sale e-mail we sent you, simply place your order by choosing one of the buttons below and proceeding to checkout. Type your “choices” (best to “cut and paste” the entire description right from the grab-bag list) in the "Notes" section during checkout or e-mail them to us after you made your purchase. *PLEASE REMEMBER TO SEND BACK-UP CHOICES! It saves a lot of time e-mailing back and forth and helps to ensure that you get your first choices. After all, it is the Grab-Bag, so the first customer to "grab" and purchase a certain suit gets it! 1 suit for $39 = $39 per suit! 2 suits for $70 = $35 per suit! 3 suits for $99 = $33 per suit! 4 suits for $120 = $30 per suit! 7 suits for $200 = $29 per suit! That's it...if we have any questions we will contact you through the info you provided. Feel free to email us with any questions.